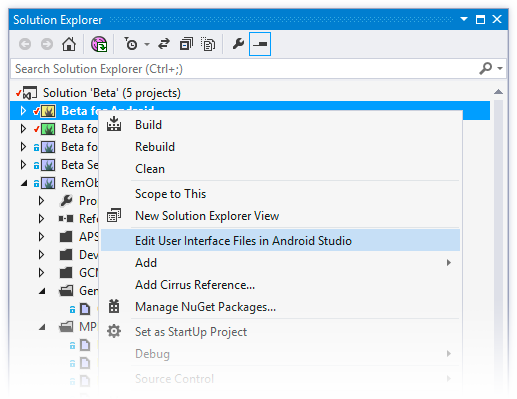 Elements can allow you to optionally use "Android Studio for Windows" to visually design the user interfaces for your Android projects in Google's official designers, as described in here. Installing Android Studio will also offer to install the Android SDK for you, saving you the trouble to do so manually. Elements should detect Android Studio automatically, but if necessary, you can also manually specify the path in the Tools|Options Dialog. Editing Android XML Layout Files in Android Studio. Integration with Android Studio for visual design of Android Layout files is new in Version 8.1.